Shakunetsu no Kimono: Yes, it's taiko....but we are wearing Happi Coats! You may have seen people wearing happi coats at your local Japanese festival. Happi (法被, 半被) are traditional light cotton jackets worn over regular clothing like t-shirts, jeans, khakis, and shorts. The sleeves are straight and the front panels do not overlap much. Usually they come with an obi if you order new happi but many people do not wear it, so it seems to be optional for the most part. 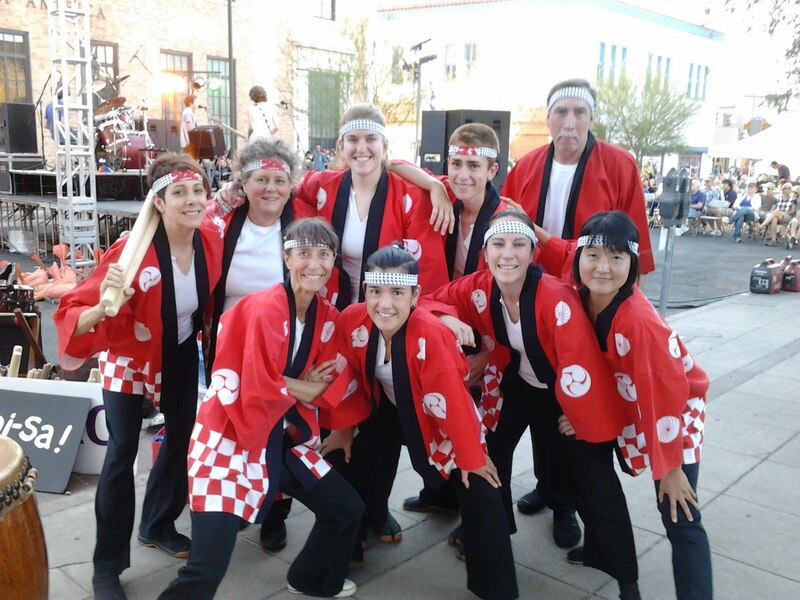 Happi are often worn at festivals and you will see them at Obon. Colors and designs vary quite a bit but are almost always use bright or primary colors for visibility. The ones we are wearing in the above photo have the kanji for matsuri ("Festival") printed on the back. The hachimaki (headband) we are wearing also have the same matsuri kanji in red in the center. Happi coats are perfect to wear at Japanese festivals when it's a bit warm (you can wear a tank top and shorts!) and you want to be very causal; men and children seem to like them because they can just put one on over whatever they are wearing, unlike yukata or kimono. It's easy to look festive when you are wearing happi! Where to buy: eBay often has used happi. You can also buy them online at happicoats.com ,and at some Japanese festivals. You can also order custom happi online at various stores with the name of your taiko group, club, or temple on them. The Buddhist Temple of Salinas, CA has gorgeous customized happi you can buy during Obon: they are turquoise and purple. 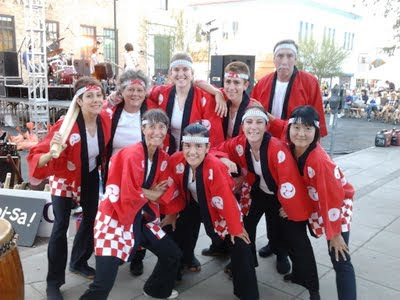 The photo: I'm on the far left with the odaiko bachi.